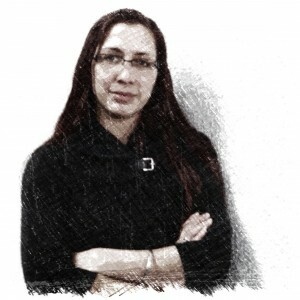 In early February of 2016, DāNite’s Senior Project Manager, Michael Cox, received an intriguing email from Alex Cole of Basecraft, a company that creates branding experiences. She, with Kate Schroeder and Christiania Moffa of Steiner + Associates were at the concept stage of a March Madness themed campaign for OSU’s South Campus Gateway. 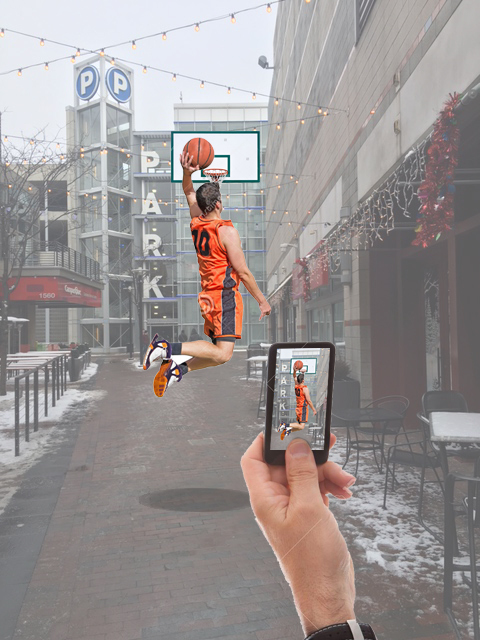 “The idea is to create a forced perspective photo opportunity to make it look like someone is dunking (a basketball) in the alley of the Gateway,” Cole wrote, and sent along a photoshopped mock up to that effect. A meeting was quickly set and fabrication brainstorming began. Time was of the essence because the shot clock was already ticking. 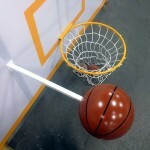 But before the March Madness kick off on March 17th there would be many hurdles to cross! 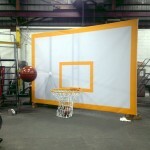 The backboard, pole, and net were easy. 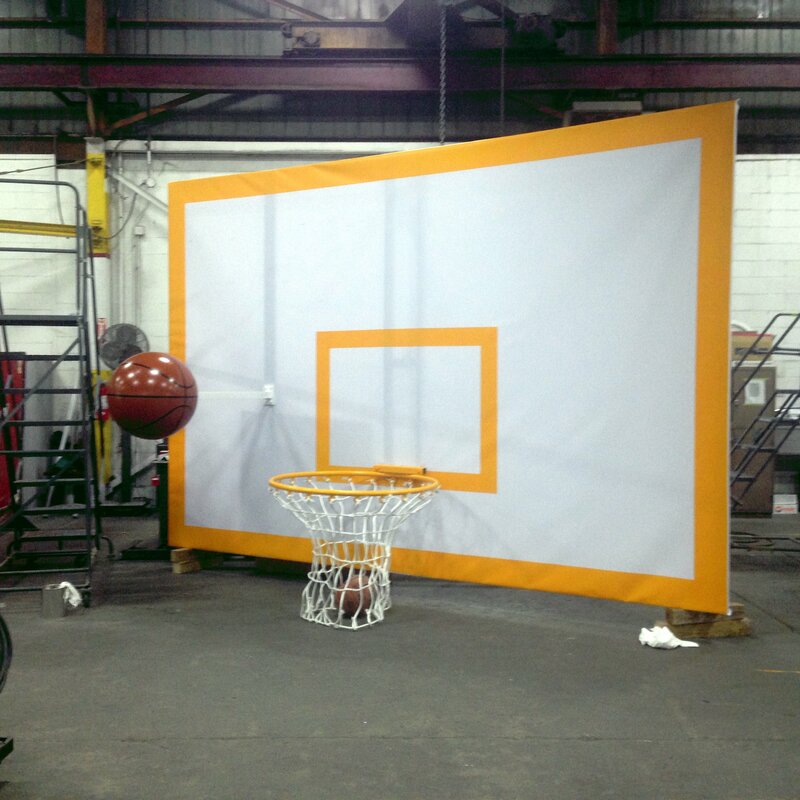 At 15’ x 10’, the flex face stretched over a welded frame at 2.5 times the size of a regulation backboard. The orange lines were masked and painted, and the Gateway logo was digitally printed and applied. 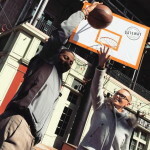 Originally, the backboard was proposed to hang from the CampusParc parking garage which faces High Street from the back of the Gateway, but a glass curtain wall and access problems necessitated an alternate location. 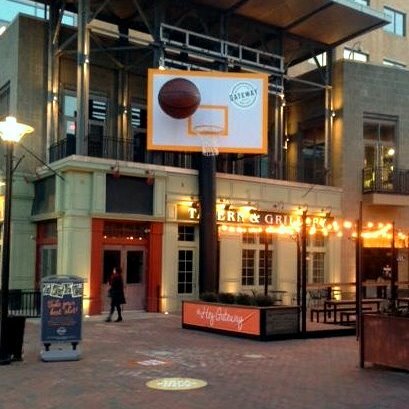 Cox explained, “We ended up utilizing the patio deck of the vacant space that used to house Oxley’s Tavern, allowing for a much closer proximity to High Street.” He went on to describe that this placement required a welded frame to turn the backboard at a 30 degree angle from the building. The “pole” is actually 24” painted Sonotubes, which are cardboard forms normally used to pour concrete column bases for parking lot lights. Sections of Sonotube were screwed together with two-by-fours from the inside, and weighted down with 55 gallon drums filled with sand. The hoop is ½” diameter pipe, rolled to a 48” diameter and painted orange, and the net is 7/16” nylon rope, bought from a hardware store, and woven and cinched together in places to give it form. 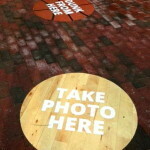 Spots were digitally printed on textured 3M vinyl and heat applied to the brick pavers in the alley to indicate where the person dunking and the photographer should stand. 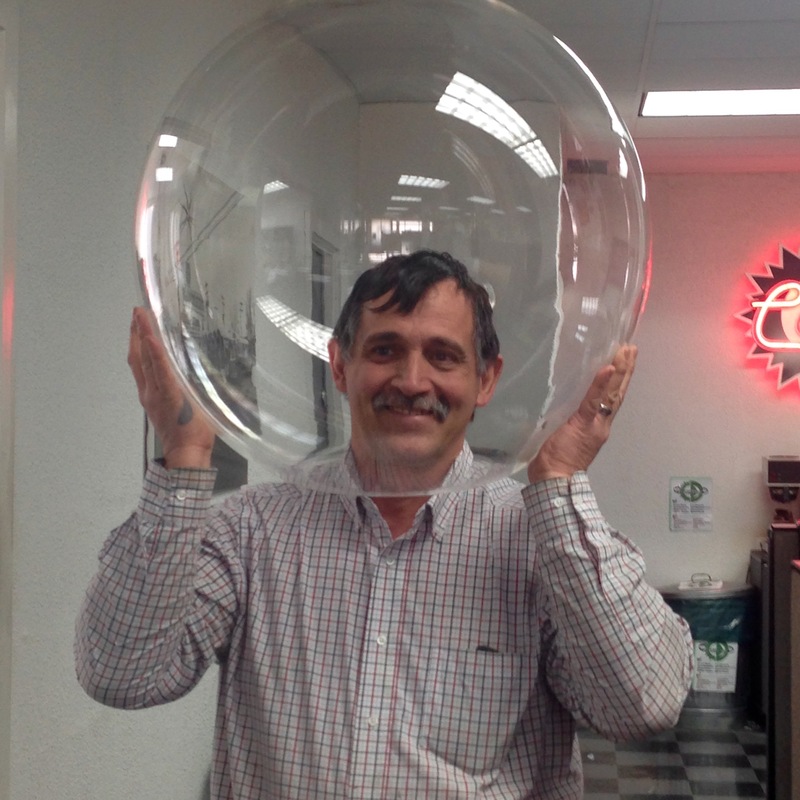 The original basketball was a 24” clear acrylic light fixture globe, painted brown with applied vinyl stripes. It was scaled to the backboard at the size of a regulation ball. “Original” is the key word there. 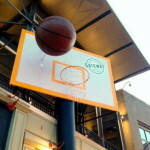 Who would have would have guessed that a basketball, of all things, would be the single greatest challenge? 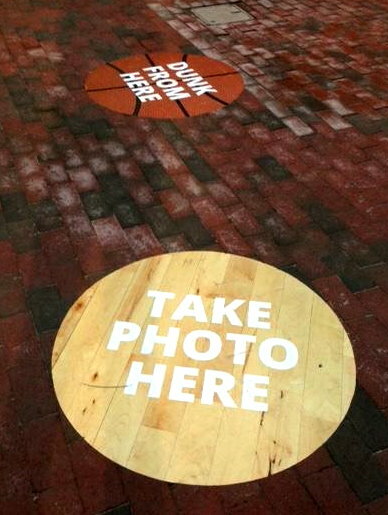 DāNite Sign Company’s installation crew installed the Gateway’s “Take Your Best Shot” ambient media campaign on Friday, March 11th, and they of course had to test the illusion themselves. 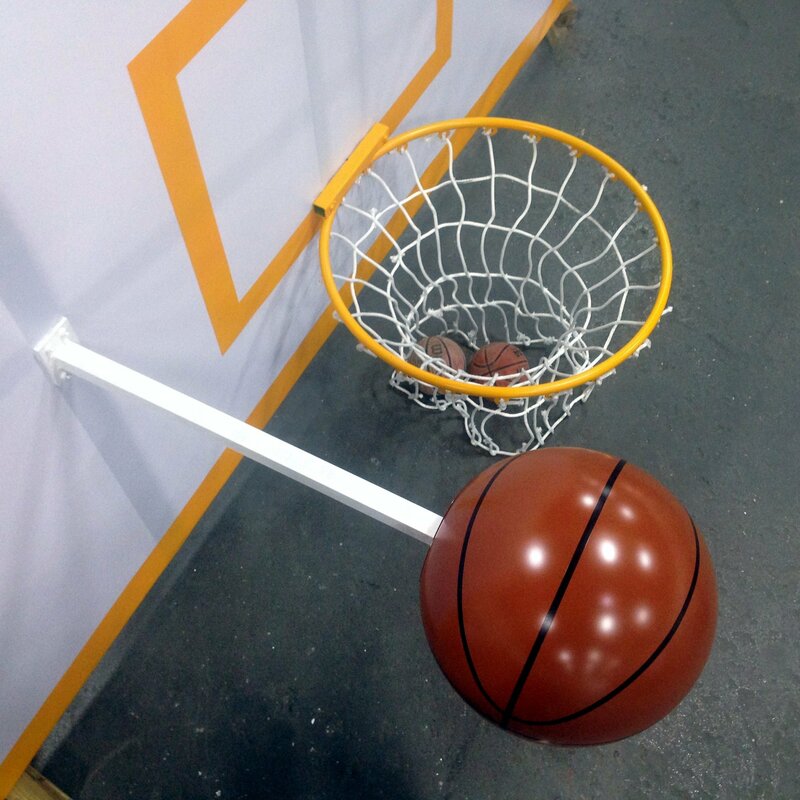 Disappointingly, the 2’ basketball, which was scaled to the 15’ backboard, appeared to be the size of a tiny suction cup set that you might put on a child’s bedroom door. This would not do. It needed to look like a regulation ball! Recalculations were made and Tim McCord, the owner of DāNite Sign, ordered a 5’ diameter beach ball for overnight delivery. 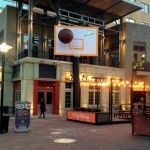 The intent was to cover the ball with water activated fiberglass sheets. Incidentally, Tim was informed by the beach ball vendor of the surprising number of 5’ beach ball emergencies that require overnight delivery. Who knew? 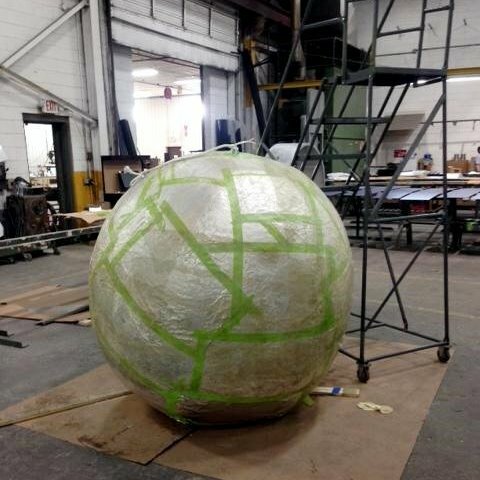 DāNite Operations Manager, Bruce Tokar, wrapped the beach ball with aluminum foil and masking tape to prevent it from melting in a chemical reaction with the fiberglass resin. It looked, for all the world, like a gigantic cat toy. But that technique had to be abandoned when it was realized that the resin would never harden in time to complete the replacement ball for the March 17th kick off. We were on to plan C, and the shot clock was winding down. Styrofoam Bead Boards in 8’ x 2’ x 2” sheets were purchased from White Cap Supply, across the street from DāNite’s shop, cut into concentric circles, and shaved all night long. Early the next morning it looked as though it had snowed in the shop. The Ops Manager joked that “he might have to ground himself to get all the Styrofoam bits off of his clothes”, and installer/shop helper Matt Green claimed he was finding Styrofoam in his pockets for days. 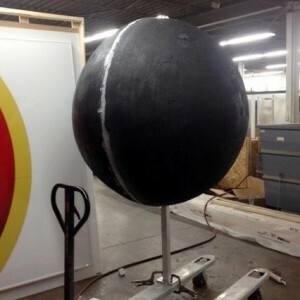 Once it was finally shaped, they used a latex-based primer to protect the foam ball from melting and shrinking when it was painted. Vinyl stripes were applied, very last minute, and the replacement basketball was installed early in the morning on St. Patrick’s Day, March 17th. 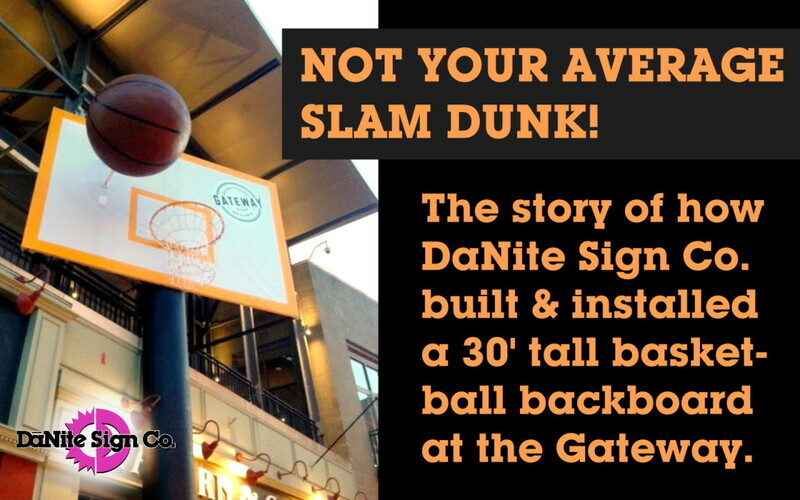 This time it was a slam dunk! 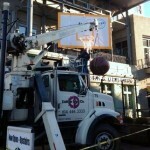 DāNite Sign Company is proud to be part of this campaign. We got to stretch ourselves in to the ambient media category, test our problem solving skills, and prove our resolve to deliver the best product possible under a tight deadline. 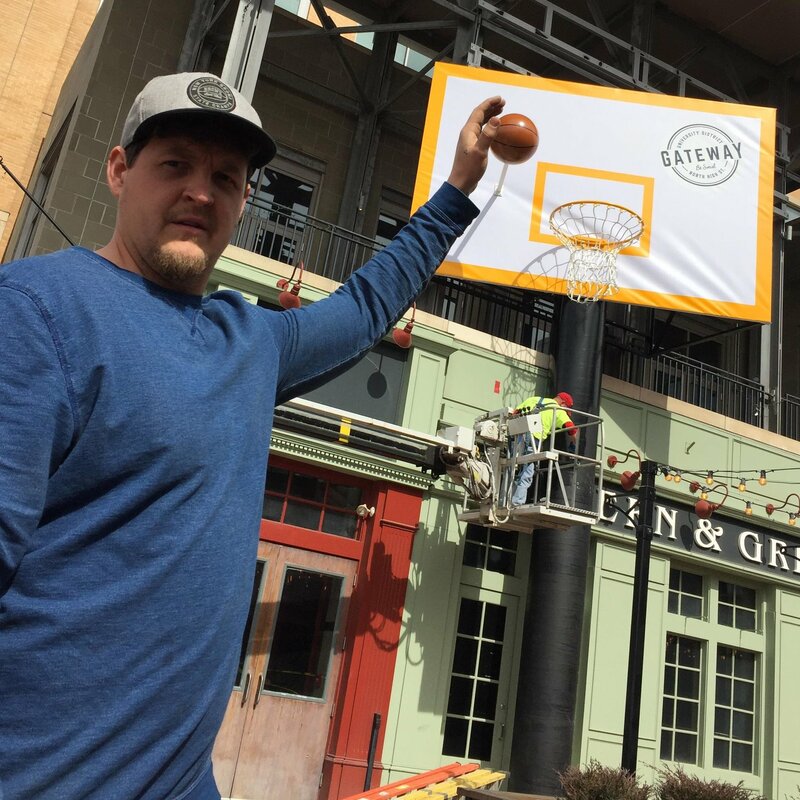 Jobs like this remind us of why we love the signage industry so much, and how grateful we are to be called upon by such creative minds to make such projects happen.